Today's Green Bargain is brought to you by EIO! EIO Kids Cup is 50% Off the retail price of $14.99! Totally BPA free. Unmatched Versatility. Environmentally Friendly. EIO Kids Cup is a uniquely designed training cup for ages 18 months to 5 years. Graduating from bottle to cup has never been easier or healthier for a child than with the EIO Kids Cup. This one-of-a-kind glass trainer teaches toddlers how to sip from a cup, a speech development milestone for toddlers. 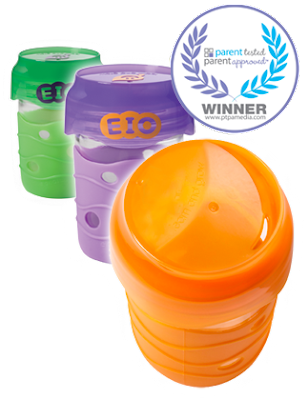 The EIO Kids Cup uses a BPA free, valve-free, screw-top cap, an 8oz. canning jar and an easy-to-grip silicone sleeve that transforms a glass canning jar into a spill-resistant, modern training cup. The EIO Kids Cup makes learning to drink from a cup easy! This innovative product is endorsed by Dr. Jen Berman, author of Superbaby and recent winner of the 2011 PTPA Seal of Approval. It is available in Orange or Green. This is the last cup your kids will ever need. Learn & Grow with EIO today!